Stewart is privileged to have examined and advised on thousands of projects from household furniture items to museum and important private collection pieces. Hundreds of reports containing provenance notes and recommendations on wooden pieces that also include glass, metal, ceramic, stone and fabric components have been prepared over the last four decades. With decades of experience examining and carrying out sensitive and cost effective restoration work on an infinite variety of pieces, his ethos is always to retain original material with the least possible replacement and alteration of original finishes or fittings. Client’s enjoy the efficient, straightforward and often revealing service that allows them to make informed restoration work choices with a complete command of the facts. He strongly recommends Stewart Linford furniture polish as it does not create smears, even on gloss surfaces. The polish is an emulsion of oils that is anti static and free of silicones that often cause problems when pieces are stripped and repolished. Wiping wooden surfaces with a damp cloth causes the wood vessels to expand, raising the grain and degrading the finish. 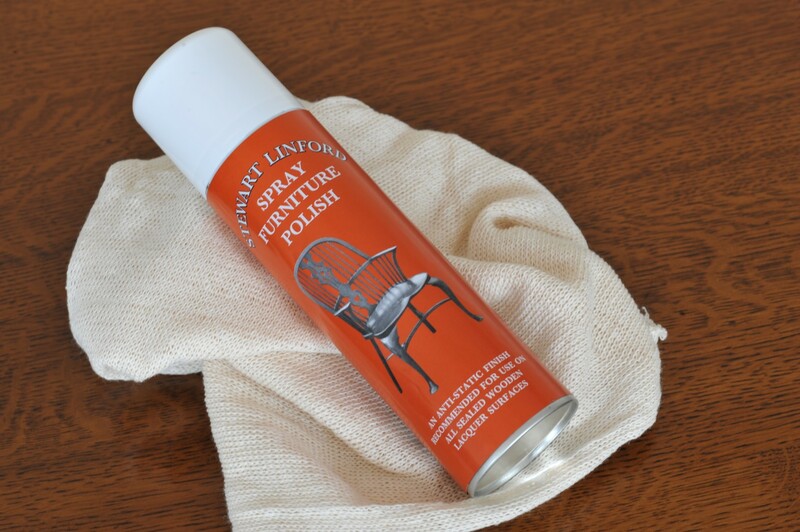 Stewart Linford furniture polish feeds the wood correctly, protecting and enhancing your treasured pieces. The creation of exquisite bespoke freestanding and fitted furniture. This is ensured by the Stewart’s core ethos of design excellence complemented by sound principles of construction. One instinctively knows when something is right. Discerning lovers of good things in life across the length and breadth of the Country are quietly accumulating their own individual pieces of Stewart Linford’s art. Whether selecting and book-matching boards of rare burr elm through to custom making special cabinet fittings and ensuring that slots in brass screws head are in line with the grain direction, attention to detail is core to our business. There is an old Wycombe saying: “The quality of polishing makes or breaks the piece”. Our extended network of Master Polishers practice the time-honoured arts of French polishing right through to the application of modern hard wearing gloss lacquers. Colour samples may be prepared for client approval prior to application to ensure full satisfaction. The range and style of finishes is extensive and includes: Special paint finishes, Polyurethane lacquers, Textured liquid metals. Liming, bleaching, oil and waxing, antique and distressed finishes, Gilding and patination of metals. Stewart Linford strongly believes in sustainability of the precious timber resource and therefore became a founder member of Woodland Heritage in the 1980s. An organization set up to improve the way in which trees (particulary broadleaf) are grown, maintained and harvested in the UK. Woodland Heritage is pledged to playing it’s part in doubling the tree cover in the British Isles.